Eine Sammlung von 15 CSCL-Scripts mit Beschreibung und Einteilung in Skriptklassen. 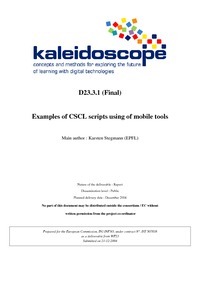 The purpose of the present document is to assemble a large variety of CSCL scripts that each describes a concrete use of learning technologies, and of integrated learning technologies in particular. The scope of this work has been limited to assembling existing scripts, following a common framework of description. The scripts have been contributed by the partners, each of them having actual involvement in practicing these scripts. The team thus had first hand access to the actual experience of extracting and applying the script. This being said, many if not most of the scripts collected herein are experimental and definitely not part of mainstream and large-scale learning practices. The scope of this work deliberately excluded technology development, the focus being on realworld cases in integrated learning. The scripts are being described with reference to the technologies being used. No detailed technical descriptions are provided, except when necessary to understand the script, but references to available material are given whenever these are available. This deliverable contains 15 scripts that are described in an informal but structured and uniform manner. In order to make sense of this collection, an organizational framework is provided that positions scripts with respect to learning aims and the role of mobility. This organizational framework is further enriched with tentative reflections on scripting techniques, the relationship to pedagogical design classes, and the role of scripting in the broader range of objectives within Kaleidoscope.